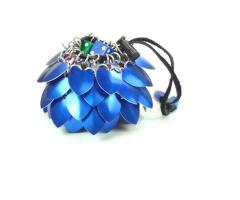 Keep your favorite dice safe and sound with this medium blue scalemaille dice bag. The bag holds 20 to 40+ standard size dice. Any dice shown in the picture are for display purposes only and are not included with the product.